Successfully Added Cleverdog Bark Stop Collar with Alert to your Shopping Cart. New high tech bark prevention and training collar that uses both an audible alert as well as a mild shock to help you in training your dog to control his/her barking and behavior without causing any physical harm. This collar is a very effective behavior modification device to help train your dog to stop nuisance barking and bad behavior. Triggered by your dog's own barking, the Cleverdog Bark Stop Collar with Alert give out a loud beeping tone along with a mild shock. The audible sound and shock are not enough to hurt your dog, but just enough to get them to change their behavior. 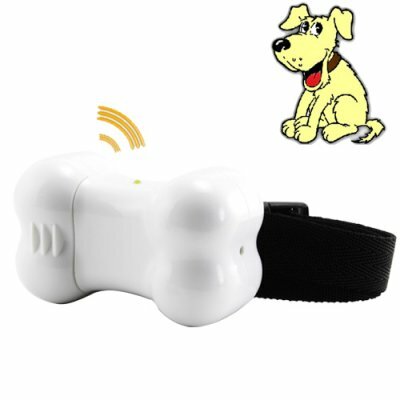 Your dog will quickly learn to associate barking with the shock and audible alert of the collar. This is an effective training device to control your dogs excessive barking in a non harmful way. It is most often used as a training device for dogs that have not responded to normal discipline techniques. A great wholesale price makes the Cleverdog G105 Barkstop Collar with Alert perfect either for the re-sale market, OEM market, or personal use. As always, it is only available direct to you from the original source for wholesale direct from China electronic products, Chinavasion. This product uses a 6V battery, type L1325 (also labeled as a 6 volt 4LR44). The battery must be purchased separately. Does your dog bark at the wrong times? Are you sick of the neighbors complaining? Can't get any quiet time on your day off? Can't train your dog not to bark? SOLUTION: A Bark Prevention Training Collar! The user should only use this device in accordance with the instructions provided and after consulting with your veterinarian. You are solely responsible for ensuring that importing, sale, and use of this product is legal in your locality. No one likes the idea of giving any kind of shock to their furry best friend, however the electric current produced by this device is very mild. Try it for yourself before putting it onto your dog. You will notice that the shock only provides a slight, temporary discomfort. Another alternate is to turn it upside down so your dog hears the sound alert but does not feel a shock. What is the operation cycle and how long does the shock last? The shock lasts less than 1 second. If after 5 more barks within 1 minute the dog does not stop barking, then the alert tone and shock will go into a second, longer phase of 2 seconds. Reseller Note: This factory direct dog training collar is finally available to the public at a wholesale price. If you need a smartdog / cleverdog / petsafe brand collar, get the OEM version at 1/4th the price - straight from Chinavasion!